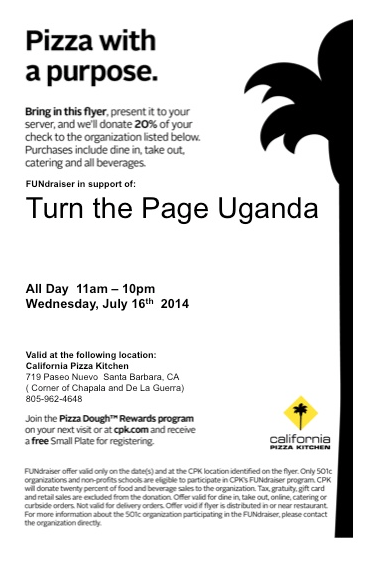 California Pizza Kitchen Helps out Turn the Page Uganda! Lira Integrated Senior High Students Chat About Their New School Textbooks! Teachers have a chance to catch up on everything they have put off for the last year! Turn the Page Uganda has a chance to reflect on the past successes, and move forward to help more students and teachers in Northern regions of Uganda receive much needed textbooks. With your help, we have assisted 55 schools in remote regions of Northern Uganda. Another 20 schools are on our current wait list (and the list grows weekly as more schools hear of Americas desire to help foster education in underserved areas). However, we NEED YOUR HELP to raise funds to supply these under-priviledged schools on our waiting list. Thanks to the generosity of California Pizza Kitchen, we will be holding a "Turn the Page" day on July 16 in Santa Barbara. Just take a copy of this coupon, and California Pizza Kitchen will donate 20% of their sales to our organization. You can also order for your company (take out not delivery) and they will honor the coupon. You get great food, and kids get great books! What an awesome way to celebrate summer and help at the same time! Thank YOU for making a difference in the lives of those who really need our help.